You want more from a battery case than a top up for your smartphone. By wrapping a battery around a smartphone, most such cases block off the headphones slot, get in the way of the speakers, and can be a pain to get on and off. Not so the Odoyo Power+ Shell EX, which adds some extra features and a particularly fluid and competent design that makes it a must-have for travellers. If you’re spending hours watching videos on your smartphone, perhaps on a long haul flight, a bus ride or a train journey, a case with a kickstand is a must. It’s a relatively rare feature on smartphone cases, but on the Odoyo Power+ Shell EX a flick of a fingernail brings down a small kickstand from the rear of the case. If you have a tray table nearby, it’s video heaven. Our only concern is that it’s pretty flimsy, and could easily break-off after a few weeks or months’ use. Elsewhere, the design of the Odoyo Power+ Shell EX hugely impresses. It’s slim at 139x62x15.5mm and weighs only 77g, while getting around the earphones problem (most battery cases accidentally block access to the shallower L-shaped earphone connectors) by providing a short two-inch adapter. It’s perhaps not the most perfect of all solutions possible, but if you connect it to your earphones – and perhaps put some Sellotape around the join just to be safe – it shouldn’t go walkabout. Inside the Odoyo Power+ Shell EX is the same 2,200mAh battery found in almost all of battery cases, which gives around 9o-100% is charge to an iPhone 5s. It charges-up via a microUSB slot on the bottom of the case, with a cable supplied in the box. The Odoyo logo on the back lights up red if there’s only a third of power left, blue if there is between and and two than the thirds, and green if there’s more than two thirds charge left in the battery. It’s a handy and stylish alternative to using four LED lights, which most battery cases display. There are other impressive design aspects to the Odoyo Power+ Shell EX, including cutouts for all buttons instead of overlaid rubber versions that often make completing simple tasks – such as increasing the volume, or turning the phone on and off at the top – quite sticky and slow. The flip-side is that this case isn’t waterproof, or drop-proof. Because it’s ‘Made for iPhone’, too, it syncs songs etc. with a Mac or PC – yet another rare feature. We love the Odoyo Power+ Shell EX not for its battery – it’s no different to any others – and not either for its high price. 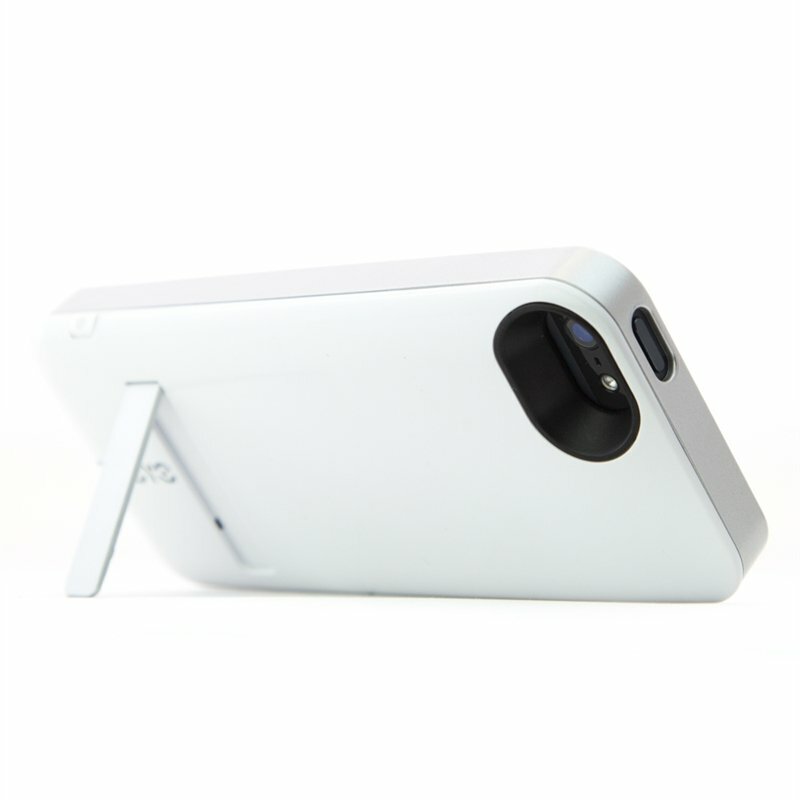 Available in white with either a gold or silver bumper, the Odoyo Power+ Shell EX is a stylish option for the iPhone 5/5s that tackles the likes of Mophie, Belkin and Incipio head-on by offering a much better though-out design. Since it’s not waterproof nor drop-proof, it is a rather urban design, but that won;t be an issue for most travellers for whom the video kickstand will surely be the second-best reason for buying.